At the Five Star Cat Hotel we never forget your cat is a treasured member of your family. Everything is done to ensure our guests are comfortable, relaxed and have everything they need. All our guest rooms are heated and each cat has access to its own individual secure and sheltered outside run. Cats from the same home are welcome to share. All the rooms are large enough for three. 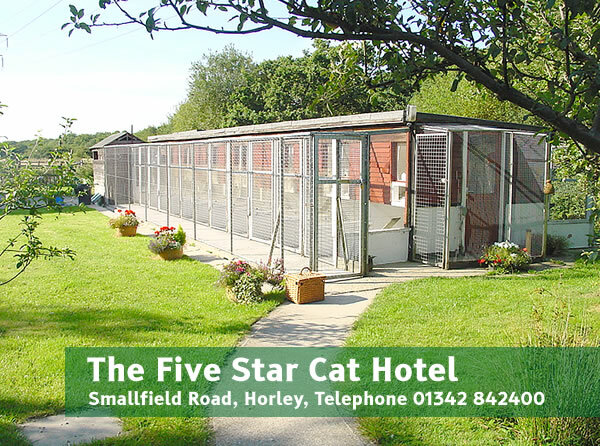 Our boarding cattery is situated between Horley and Smallfield in Surrey, close to Gatwick airport. 208 Smallfield Road, Horley, Surrey RH6 9LS. If you would like to book or have any questions please call us on 01342 842400. A Trusted member of the Chamber of Commerce.